Feed BackToForm when your horse loses that spark of energy or is lacking enthusiasm, especially mid-season, and needs that little lift. Formulated as an intense boost after illness, Back To Form has saved a lot of horses from long recovery periods, and is the perfect formulation to achieve a return to vitality. Many users of Back To Form get a great response when fed at a reduced level of one 25g scoop per day giving their tired horses that lift to their performance. Why Choose Back To Form? 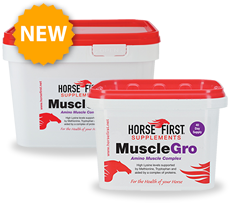 An intense boost after illness or when your horse is lacking enthusiasm or is easily fatigued. Can help support recovery after a hard race, competition or hunt. "For outstanding results take the lead of top trainers and feed Back to Form and New Bludd together." This is a 12 day course. Give three 25g scoops for the first six days. Reduce to two 25g scoops for the next six days. Can be fed long term at one 25g scoop daily.